There's something special about enjoying chocolate all year long, but when Valentine's Day rolls around, it just doesn't seem right to let the holiday pass without enjoying something a little extra special. It's just tradition, you know? Although there is no shortage of candy and chocolate found in the stores, I always find it to be a little risky to pick something generic up because I never know how good it is going to taste. Whether I'm purchasing a sweet treat for myself, my kids or as a fun surprise for a friend or teacher, the last thing I want is to be dealing with is cheap chocolate — the horrors! Instead, on the opposite end of the spectrum, I always know that I can turn to a brand that is in a category all its own when it comes to sweet, delicious and luscious chocolate and candy of all kinds: The Hershey Company. When candy manufacturer Milton Hershey made the decision in 1894 to try adding chocolate coating to his caramels, little did he know that 119 years later I would be marveling at the incredible variety and delicious flavors that would end up bearing his name. In fact, this year Hershey's has partnered with students from the Academy of Art University in San Francisco to design new packaging for the Hershey's Pot of Gold Collections. Combine those with the classic favorites that we all know and love and there's no reason that Valentine's Day 2013 won't be the sweetest yet! I love that Hershey's has made it so simple to pick up a fun treat that comes perfectly packaged and ready for gifting. How cute would it be for a student to give their teacher a Hershey's Golden Apple, Solid Jumbo Kiss or Twizzlers Strawberry Pencil Can? At the same time, I can picture my kids' eyes lighting up after finding the Milk Chocolate XOXO Bar or King Size Marshmallow Hearts waiting for them on February 14th! If chocolates that are slightly more traditional would work better for your recipient (or, ahem, you) then the Hershey's Pot of Gold Truffles is truly a wonderful choice. Filled with rich, melt-in-your-mouth milk and dark chocolate truffles, there's just no way to not be addicted to these bite size pieces of amazingness. As well as offering products of all kinds that are prepackaged and perfect for gifting, Hershey's also makes it extremely easy to use many of them in a huge variety of Valentine's Day recipes and crafts. Just look at this delicious and fun tiny sample of ideas! ...the idea of turning them into something creative and even tastier was something that I couldn't pass up. 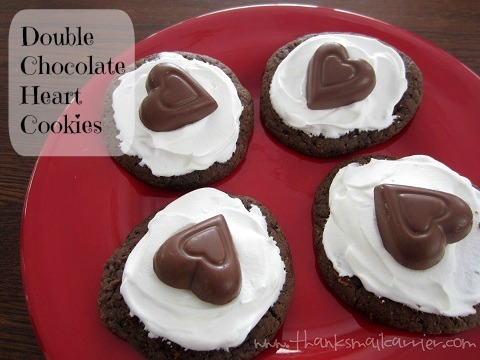 As soon as I came across the Double Chocolate Kisses Cookies Recipe, I knew that it would be just the thing that could easily be made into a Valentine's Day chocolate indulgence. Beat butter, sugar, egg and vanilla in large bowl until well blended. Add flour, cocoa, baking soda and salt alternately with milk, beating until well blended. Cover; refrigerate dough about 1 hour or until firm enough to handle. Shape dough into 1-inch balls; place on ungreased cookie sheet. Heat oven to 375°F. 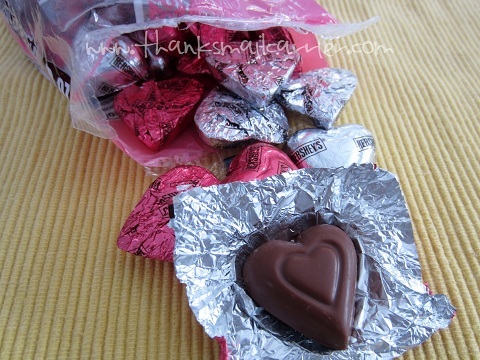 Remove wrappers from chocolate pieces. Bake 8 to 10 minutes or until set. Cool 1 minute; remove from cookie sheet to wire rack. Cool completely. Spread frosting onto cookies, leaving about 1/2 inch around outer edge unfrosted; place chocolate piece in center of each cookie. Makes about 3 dozen cookies. How adorably fun are these? I used Cool Whip instead of frosting (partially because I had it on hand and partially because I like the taste of Cool Whip more than canned frosting) and couldn't have been much happier with the results! Combine the extremely cute look with the ease of making them and the ultra-chocolate, soft, chewy flavor and this is one Valentine's Day treat that I'm sure we'll revisit in future years (not to mention making them throughout the year substituting seasonal Hershey's Kisses in for the hearts). This Valentine's Day, Hershey's has the new and classic products that will surely make your family and friends smile. New Twizzlers Nibs Heart Shaped Candy, Reese's Peanut Butter Hearts, Dark Chocolate Covered York Peppermint Pattie Miniature Hearts, Jolly Rancher Heart-Shaped Lollipops... the list goes on and on! One lucky person will win their own prize pack of delicious Valentine's Day treats (similar to as pictured above) from Hershey's! A big thank you to Hershey's for providing a prize pack for me to review as well as for one lucky giveaway winner. The opinions shared are my own and honest and if you really need to see more, click here to see how I roll. I love the Hershey marshmallow hearts! Blissssss Smoth & Creamy Milk or Dark! 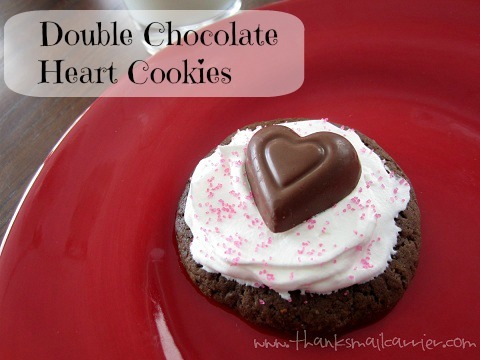 Double Chocolate Heart Cookies is #1 with me! I like the HERSHEY'S COOKIES 'N' CREME Valentine Miniatures. I love all things Hersey's! Especially their Pot of Gold Truffles. Thanks! I like the Hersheys Chocolate Hearts Assortment. I like the Reese's Peanut Butter heart. My favorite is the REESE'S Peanut Butter Filled Hearts. Thanks! HERSHEY’S HUGS Raspberry Flavored Candies! I think the pot o gold truffle collections is probably going to be my favorite. My favorite right now would have to be the HERSHEY’S HUGS Raspberry Flavored Candies-kinda have a thing for Raspberry stuff right now. I like the pot of gold caramelc ollection. 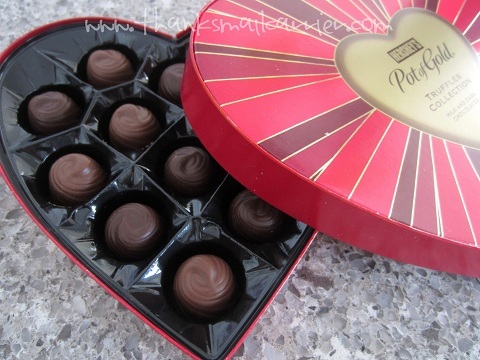 I'd love to get the YORK Peppermint Pattie Heart Box. the REESE'S Peanut Butter Cups Miniatures Heart Box yummy. REESE'S Peanut Butter Filled Hearts! Thanks for the chance to win! Hershey's Pot O' Gold Truffles! :-) Thank you. I love the Hershey's Hugs Candies. Yum! I love Hershey's Bliss - all the flavors. I buy a bag a week when I go food shopping. Thank you for the chance to win! I love the special dark minis. I love The HERSHEY'S KISSES Brand 7 oz Solid Milk Chocolate. Pot of gold caramel collection! Love Hershey dark chocolate bliss. My favorite is the REESE'S Peanut Butter Heart. I like Hershey Kisses with Almonds. I love the golden apple. My favorite Hershey's Valentine candy is the HERSHEY’S POT OF GOLD Truffles Collection Milk Chocolate. 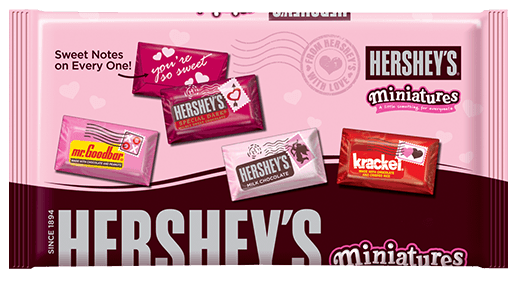 Leave a comment on this blog post telling me your favorite Hershey's Valentine's Day product. I really like the Pot of Gold Caramel Collection. I like the Hershey's Pot of Gold Premium Collection Heart Box! Thanks. I thought the Love Bug Cups were cute. The chocolate Hearts bag! Oh my how the kids adore chocolate in forms like this..they thinkit's very special. I like the big 5lb chocolate bars. I love all things Hersey's! LOL! Milk Chocolate XOXO bar is my favorite. My favorite is the HERSHEY’S BLISS Brand Rich & Creamy Dark Chocolate Brand. I like the HERSHEY'S KISSES Brand 1.45 oz Solid Milk Chocolate. REESE'S Peanut Butter Heart. I got my husband this last year, I think. I like the HERSHEY'S COOKIES 'N' CREME Valentine Miniatures! The HERSHEY’S POT OF GOLD Truffles Collection Milk and Dark Chocolate looks really nice! Yhummmmm!!! I like the dark cocolate heart of gold truffles. As I am partial to peanut butter, my favorite Hershey's Valentine candy is the peanut butter filled hearts. I love the V-day hershey's kisses! HERSHEY'S POT OF GOLD Premium Collection Red Pillow Pattern Heart Box would about cover it, wouldn't it? Ooh, I've never tried--or even seen-=-the Hershey's Golden Apple, but I'd love to get one for Valentine's Day! I love the YORK Peppermint Pattie Heart Box! My favorite: REESE'S Peanut Butter Filled Hearts. 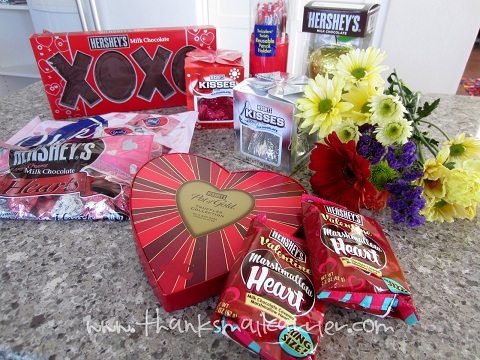 Love the Valentine's HERSHEY'S HUGS and KISSES Brand Assortment! Hearshy's Pot of Gold Truffles are my absolute favorite! I LOVE the Hersheys Pot of Gold Caramel box of candies. Yummy! 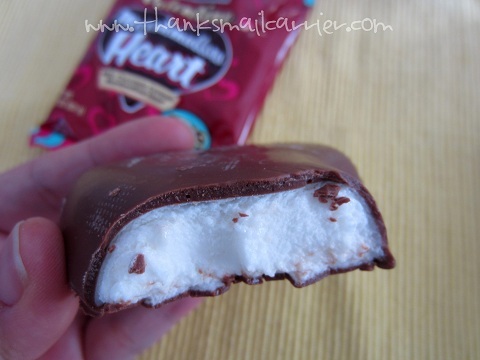 YORK Peppermint Pattie Heart Box. I love the HUGS Raspberry Flavored Candies! Hershey's Bliss have been my favorites lately! I like the pot of gold caramel collection. HERSHEY’S HUGS Raspberry Flavored Candies. Thanks. I like the KIT KAT Wafer Bar Valentine's Exchange bag, Kit Kats are my son's favorite. I like their GIANT Hershey's Kiss and get one every year which takes me a couple of weeks to devour. I love the hershey kisses. I love the REESE'S Peanut Butter Hearts YUM!!! 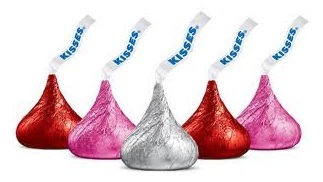 I love the Hershey Milk Chocolate Kisses. They are such a classic! I love the Bliss Milk Chocolate! Thanks so much for the fantastic giveaway! Hershey's Bliss milk chocolate are my favorite! The Hershey's pot of gold caramel collection..yummy! I love the HERSHEY'S Milk Chocolate XOXO Bar! york peppermint patty hearts are my fav! I want the kisses with nuts!